Welcome to my cook book Cookery Point. 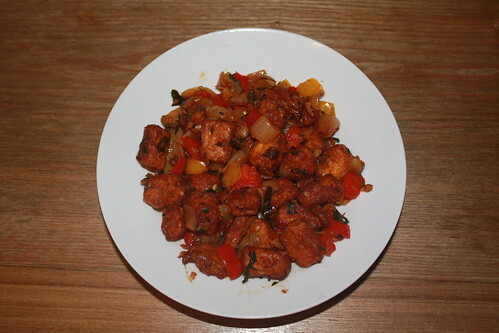 Today my recipe is Chilli Paneer. It is an Indian adaptation of Chinese recipe. It is a perfect appetizer. This can be made with paneer and varieties of chilli. 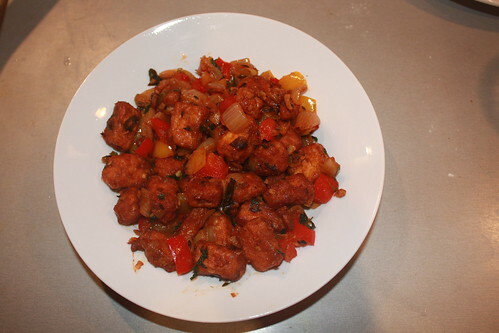 Chilli Paneer is served as starters in both North and South Indian restaurants. Now lets see our recipe..
Cut the paneer in to small cubes. Take a bowl, add salt,ginger garlic paste,corn flour and egg. Water is preferable for vegetarians instead of egg. Mix it well and fry the paneer cubes in oil. Now, Paneer fry is ready. Heat oil in a wok, add cumin seeds,chopped garlic,ginger garlic paste and greenchilli. Now add onion and fry them well. Add coriander powder,mix it well and add little water. Fry for few minutes and add chilli garlic sauce and ajinomoto. Now add red and yellow capsicum and fry them well. Add chilli powder and soya sauce and mix well. Add salt and curry leaves, fry for few minutes. Now add lime juice and fried paneer and mix it well. Garnish it with coriander leaves and it is ready. Chilli Paneer can be served as starters. Hey it looks reaaaly yummy...mouth watering.. I will try this for new year's eve...this will be my 1st paneer dish.. I request you to post some recipes of TamilNadu. Your recipes look great.Good going..